Renovated and professionally furnished in 2015! Condo offers beautifully decorated spaces for all to enjoy. Plenty of seating for meals; table seats 6 comfortably along with additional bar seating for 3. Enjoy hardwood floors, stainless steel appliances, granite counters, private laundry, all new lighting, berber carpets, professionally designed closet systems. Living Room is beautifully laid out offering comfortable seating and some additional poufs for the kids to hang out on. Enjoy 52" flat panel and docking station for your music enjoyment. Each bedroom offers new berber carpet, custom high quality blinds, pillow top mattresses, luxury bedding and flat panel tvs. The exterior deck offers new seating and a couple of chaise lounge chairs to catch some sun on the deck in comfort. Beautiful oceanside views from the deck. Enjoy the Thursday night fireworks right from your private deck. 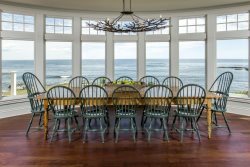 Enjoy fabulous ocean views at the new Grand Victorian. Amenities include indoor heated pool, fitness center, sauna, beach access, hotel services, private laundry in unit, parking, restaurants, shopping and so much more. All utilities included: Heat/Hot Water/Electric/Cable/Wireless broadband. Linens and Towels provided. Beautifully furnished condo. Right on Old Orchard Beach and directly next to arcade, so at night was a little noisy until about midnight or later so if being in the middle of the action is what you are looking for its perfect. Driving in and out was a little hard depending on the number of pedestrians out and about.